Embracing your relationship and the joy it brings you can create transcendent collaborations with your photographers, such as this shot. This groom-to-be wrapped his arms around his fiancée incredibly tightly and pulled her close, planting a kiss (and maybe a nibble) on her jawline, causing her to crack up beyond measure. 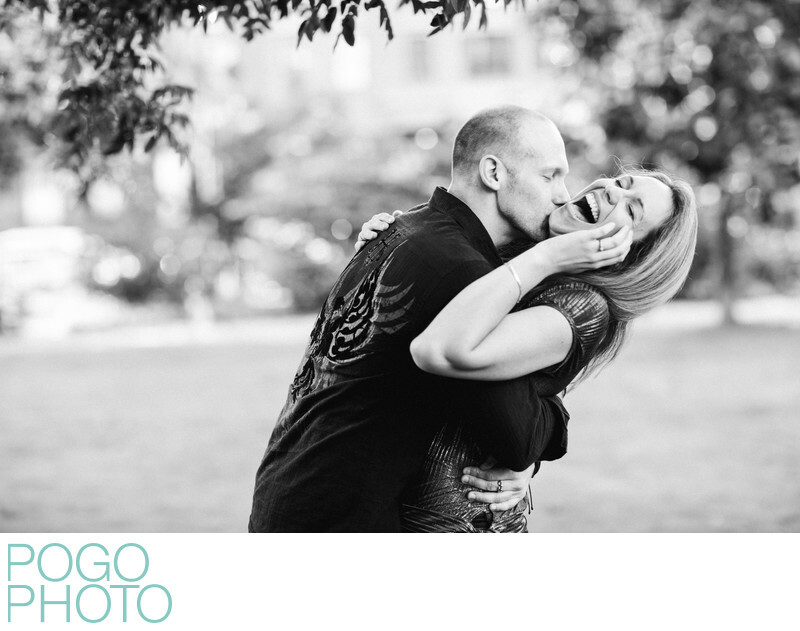 This couple loves being around each other, and you can tell! Genuine emotional engagement session images are always our goal, and the best way for you to help us create these images are to simply let go and be yourselves. The rest will follow. Compositionally the movement created as the couple pulls toward the upper right corner of the frame follows the traditional rule of thirds, while the choice of a portrait lens and a wide aperture reduces the potentially distracting sunlit trees and brownstones behind them to a pleasingly blurred backdrop of bokeh and tiny leaves. This part of Boston is usually filled with tourists, but their session was during dinner time in the summer, which meant that we ran into fewer strangers while wandering from park to park and exploring the small streets of the North End. Boston Common is a respite from the heat of the city on summer days, feeling like an oasis of lush greenery compared to the streets that shimmer with the rising warmth by day’s end. Location: Boston Common, Boston, MA.